Paintshop Pro 7 or some other drawing tool that has layers, gradients and noise. A Paintshop Pro demo version can be obtained from Jasc - but it's well worth buying if you can afford it. Maxis/EA have done a terrible thing to us as creators and users - they've made objects more anonymous than they used to be. As Creators, it's difficult to work out which file is what we've created to share. As Users, trying to identify files we want to move in and out of the game or delete is impossible when we can't tell the difference between a package that's a wall, a floor, a skin or an object recolor. So we need to get around this, especially if we as creators don't want to use Sims2packs. The easiest way to identify our creations, is to create them in a game which has nothing else in it. 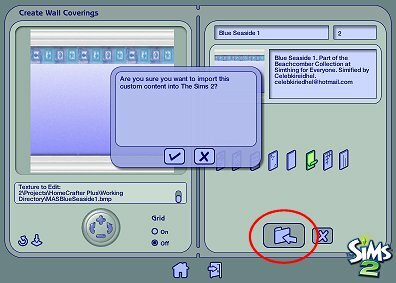 If you've done the Tutorial, "Creating a Game Space for Sims2" then you'll know what I'm talking about in Step 1. If you haven't done that tutorial - go do it now. We'll wait for you. STEP 1 Make the Sims 2 - Testing version of the game, the main version of the Game. Rename your playing version of The Sims 2 to "The Sims 2 - Play"
Rename your testing version to The Sims 2. OK. Lets look at where we will be creating the new walls and floors. This is an excerpt of "The Sims 2" sub-folders. If you look in "Downloads" folder - you notice it is empty. (If it isn't, then make it empty, you can leave in the C.E.P. package though). Creating things is done in the Projects folder, under "HomeCrafter Plus" folder. New walls and Floors and Ground Cover, go as bitmaps in the folders labeled Floors, Walls, and Ground Cover. You can put sub-folders in these folders, but HomeCrafter will only take notice of the those folders. The Working Directory is where files are put when they are being edited. (You can basically ignore this folder, unless you've got things to correct). 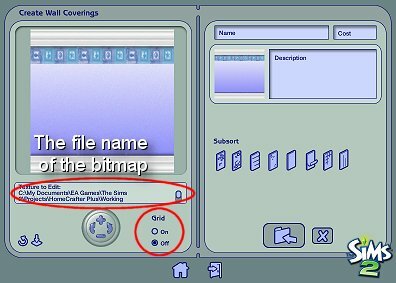 In Creating the bitmaps for walls, floors and ground covers - the only difference between Sims 1 and Sims2 is the size of the bitmap. 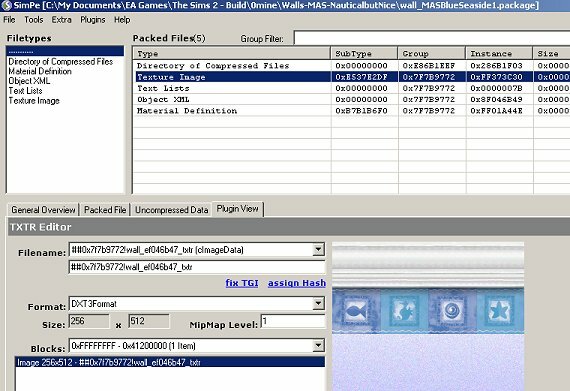 In Sims2, the template size for walls is 256x512, and floors and ground covers are 256x256. 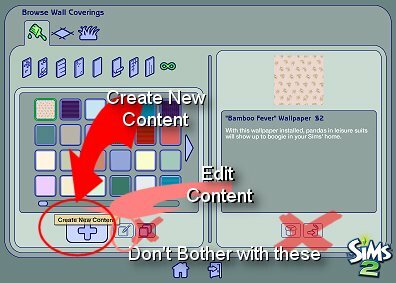 So most all the tutorials out there for Sims 1 walls can be used for Sims2, as long as you take into account the size difference. The other thing, is that walls are no longer limited to 256 colors. So lets start with a basic wallpaper - as in Sims 1 but making it for Sims 2. I won't explain the same things again - feel free to go have a look at the sims1 tutorial if there's a setting you don't understand. Open up your paint program and create a new file 256 x512. Set up the details as in the picture. This allows you to create a quality image with good color. (The Sims 1 tutorial has an explanation of all the settings). Choose 2 Colors - I'm making a sea themed wallpaper, so I'm choosing blue and white - but any color and white looks good. Set up the gradient as in the picture, with the white at the top, and the other color at the bottom, no repeats. Fill our bitmap with the gradient. Then add noise to give a less defined gradient. Use this bitmap to add a pelmet and foot board onto the wallpaper, if you desire. You can also add a wallpaper border if you like, but I'll let you find your own, to match the colors you've chosen. Don't worry about reducing the colors - we can have millions of colors in the game now. Do as many bitmaps as you like, before you convert them into the wallpapers using HomeCrafter Plus. When you save your bitmaps, give them a descriptive name - you'll be able to track the walls through HomeCrafter and for loading on a website. OK Now we get to open up HOMECRAFTER! This is the splash page. You don't have to come back here after you start creating your walls, floors, whatever - you can swap in the next page. OK - you can see that the tabs on the top let you choose between walls and floors and ground covers. Unless you're cloning an existing wallpaper, you might as well ignore all but the buttons at the bottom. Don't bother with the Clone button or the packaging button or the delete button. Sims2Packs are a waste of time and space. The button to choose for new wallpapers is the "+" sign. Click on that, and it will bring up the bitmap list for you. Select the bitmap that you want to make into the wallpaper and press the tick. As you can see, it only gets bitmaps from the Walls folder. OK. The obvious things first - on the Right hand side enter the name, Cost and description that you want. I generally have a similar name to the bitmap, as it will make it easier to link them on the site. The Sub-sort is the same as the sub-sort that is used in the game. If you hover your cursor over the different types, it'll describe it if you're not sure. You must pick a sub-sort though. It won't let you save it otherwise. The Left hand side has the less obvious things. First up the picture displayed comes in with 3 vertical lines. This is the grid. You can turn it off with the radio button in the circle. If you look at the texture to Edit: you'll notice a couple of things - (1) the folder that it is displaying from is the working directory. If you notice there's a problem with your bitmap, WHILE HomeCrafter is open, you can open up this bitmap and correct it. Then refresh the bitmap with the button on the extreme left hand side. (2) The bitmap has the same name as you gave your original. The +/- left/right arrows in the middle are about turning the wall, and zooming in and out. (Fairly, to very useless). If you do use it, then the button with the arrow pointing down, will reset the view back to default. The button circled will save your wall. Not only that, it will create a .package file in your downloads folder. The bad news is that the name has nothing to do with the name you gave it. This is why you don't bother with the sims2packs. Pressing it, will bring up the confirmation window, select tick to complete the process. There - you've made a wall. That wasn't hard was it? So lets make it more descriptive. I like the wall_ prefix, so I leave that there and just change the gobbledygook to a meaningful name. Tip: If you're doing a large number of wall files at once, and you've done them in alphabetic order (based on the bitmap names), then you can rename your wall files without needing to work out which wall is which. The way to do that, is to sort the windows explorer window by "Date Modified" or "Date Created". That will put the walls in the order that they were created, which is the same as the alphabetic bitmaps (even though the gobbledygook names aren't in that order). Um Kiri - I don't know which wall is which - how the halibut do I work it out? 2 ways: You can open up the package with notepad... the internal name you used when you were typing is mostly displayed. Or open up the package with SimPe. Select the Plug-in View, and click on the "texture image" - and there it is. The Object XML will show you the internal name and description. Finally - once you've finished testing, move the play version of your Game back "The Sims 2"
Rename your testing version of The Sims 2 to "The Sims 2 - Testing"
Rename your playing version to The Sims 2. (In the Example, I'll rename "The Sims 2" to "The Sims 2- Build"). 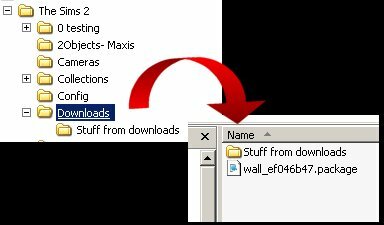 Move your new walls into the play game, into a new sub-folder or such like. Feel free to share them. And there you go - All Done.